S.K, Nauti, and Tripathi are childhood friends. S.K is a hypocrite, mean lawyer making money from out of court settlements. Nauti is an over the top fashion designer who thinks highly of herself. Things were breezy until Tripathi opens a small town Printing Press. Within months, he is charged with an Inflated electricity bill of 1.5 Lakhs, which escalates to 54 Lakhs in the following months. With no where to go and complain, Tripathi commits suicide. S.K is set aback by the events and has a change of heart. He decides to fight out against SPTL , a Privatised Electricity Company responsible for the Inflated Bills. He has Advocate Gulnaar representing SPTL as his opponent.. Whether or not he is able to sue the company forms the rest of the story. More details of Batti Gul Meter Chalu on wikipedia. Original Batti Gul Meter Chalu DVD released by T-SERIES comes in 1 disk DVD pack. While processing the order, we bubble wrap the DVD in its original packing and send it in sealed plastic or carton pack. 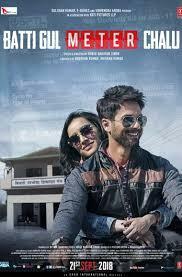 We don't offer download of the Movie Batti Gul Meter Chalu, nor we send free poster of the Movie along with its DVD order. We also don't offer free wallpaper or song download of the Movie. Poster and other accessories of the Movie can be purchased separately. Buy Hindi DVD Batti Gul Meter Chalu and watch them at the comfort Of your own home. Online shopping Batti Gul Meter Chalu DVD, Buy Batti Gul Meter Chalu DVD, purchase original Hindi DVD of Batti Gul Meter Chalu. Online store to buy Batti Gul Meter Chalu DVD	, online DVD store india, buy Hindi DVD, watch Hindi movie Batti Gul Meter Chalu videos online. We don't offer DVD renting for Hindi movies online, Buy Original Batti Gul Meter Chalu DVD @ discounted and cheapest price online in India.